INCOMING MESSAGE! -Jetzt geht’s LIVE!- THIS IS NOT FAKE NEWS! Welcome to Karmic Kick, my fancy-pants ‘.com’ blog! I usually have plenty to say about current affairs and am always open to new phenomena. I like spotting trends and being informed about events, be they ‘good or bad’ and everything in between; there’s usually plenty left unsaid. I don’t shy away from alternative sources and am weary to get tricked into one-sided viewpoints. One of the more impactful current trends in mainstream-media and politics are ‘talking-heads‘; void of their own opinion and background knowledge, these people in leadership-roles need constant input from spin-doctors and base their entire view on input from industry-lobby, thinktanks and their corporate owners. Going further; in absence of clear goals, these politicians and journalists are so desperate to look ‘progressive‘ (and not look like they don’t have a clue) that they will greedily adopt the most ludicrous ideas out of activist-fringe ideologies(!) Sowing Identitarian division, confusion, apathy and pushing the whole left-right paradigm serves them well. Popular and rational opinions formed outside politics and media are suppressed, down-played and even actively ‘smeared’ (campaigned against); ‘populism‘ or the identitarian projection ‘nationalism‘. Both are type-cast constructs, created and used to categorize / brand / dismiss (/ pre-empt / stifle) unwanted / unfavorable views. Views that directly go against the ‘beast-system’ (Babylonia). Yet it is mainstream- media (-moguls), (western) politicians, multinationals (and globalist) that are failing in trust-poles1. [And] Populism, being ‘of the people’, will always inherently hold traction and as long as nation-states and free-people (, free-speech and the right to assembly) exist. 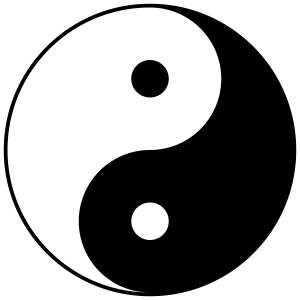 Karma and Ying-yang are metaphors to consciously categorize opposites, like good and bad, or recognize murky phenomena/choices/information, whist acknowledging chaos, uncertainty and the fluid interchanging nature of every aspect. Iconography, mathematics, construction, biology are all fields I personally have researched, among many others. I have personally indulged myself into subjects like mind-control and propaganda, because of the need to know and identify hostile tactics, when deployed. Being interested in these techniques has helped me make sense of the -why and -how things are reported/recorded in biased manners. I recognize patterns, because we live a cyclical existence; reflected by day-night cycles, seasons, tides, news-cycles, life cycles.. Using lies, guilt-tripping, baiting, framing, shouting, crying, attacking, flagging, (shadow-)banning, de-platforming, de-monetizing, restricting, limiting, artificially throttling traffic and/visibility. I see/hear it happening daily, it is often accompanied by ‘the Streisand effect’ when done to public (controversial) persona. Above tactics can be detrimental when applied to individuals with little public visibility. Some of it has happened to me on occasion. (Reddit, Disqus!) But in the most extreme cases, people can loose their jobs, access to payment-providers. Be targeted for harassment, slandered, ambushed or libeled. -The motivation behind this site is purely personal, any opinions I give here may be subject to change2. -This site is currently unaffiliated3 with any pursuit other than my own. 1 I plan to do my own trust poling through facebook. 2 Hindsight and external input does provide nuance, chances to reflect, re-evaluate, to rewrite, expand or elaborate. 3 I am open to contributions, collaborations, hosting/aiding anonymous publications.